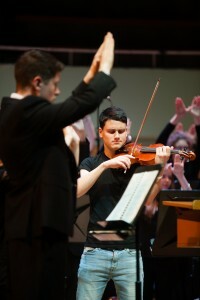 Cillian O’Breachain, violin soloist with the IAYO Festival Orchestra for the première of Dreaming in Sign Language by Sam Perkin. ‘To be involved in this great festival was a thoroughly enjoyable experience for me. The IAYO provides a very important, invaluable opportunity for young people and young orchestras in Ireland to perform on the most prestigious stage in the country, the stage of the National Concert Hall. The IAYO also fosters the talent of young solo performers and composers who are giving the chance to perform or to have their works performed.